It’s not a secret that I’m not a big fan of historical romance. Nope. Historical books, in general, normally don’t work for me. I’ll be honest… when I read the blurb my eyes must have skimmed right over those little numbers 1920, the words Great War. I think what I saw was mission, traitor, Merrow. So you can imagine my disbelief when I started this little gem. I’m continuously amazed when an author can write a story with so few pages, capturing my mind, filling it with details and knowledge, all while providing me with intriguing characters I want to get to know better. It took me about a chapter and a half to fully commit, but when I did, I was walking these streets, feeling the cold, the snow. I was there, transported and captured in a world 95 years ago. I felt the feelings of nervousness George was experiencing. I felt his budding attraction to Matthew, while also worrying that he was falling for the very man he was there to investigate. The struggles that Matthew and George both share from their time during the war, one on the battle field, one in prison, were very well depicted. I enjoyed the friendship they shared, the time and care they each took with each other, getting to know the other man, learning them, finding what they thought was a deep connection before they moved towards anything more. The traitor George is looking for is not revealed quickly so there is a kind of lazy feel to the world George lives in. To his reality. The story takes a sort of mellow walk all the way through to the end when even then, the tension and worry seems subdued. Not unlike I how I imagine anyone from that time reacting to any event. Maybe it’s restrained. Some might find the reveal anti-climatic, but I felt that I understood the reserved ways of George and Matthew. This was 1920 England after all. I also enjoyed the side characters, the interactions George and Matthew had with them. I’m pretty sure I even learned a bit from reading this that never stuck with me from school. The story is calm, even through the parts that are strained. I liked the feel, the sort of blanket I felt wrapped in. Morrow’s writing is beautiful and I’d recommend this to anyone, especially all you historical lovers out there. 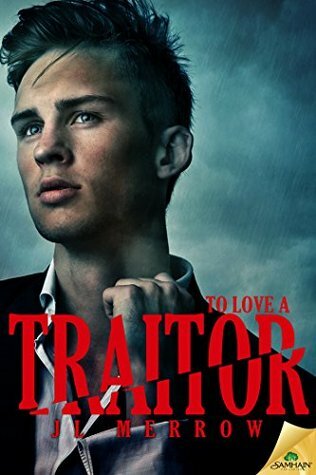 This entry was posted on September 25, 2015 by Kristie in Historical, Reviewer: Kristie and tagged 1920, 4.0 stars, disabled character, romance, traitor, WWI.